I love my AppleTV. When I get home from work, I pull out my iPhone, tap Apple’s Remote app, and tell the iMac in my basement to start streaming music to my entertainment center. I’ve been pulling my DVD collection into iTunes so I don’t have to bother with a DVD player and I’ve started to collect some TV shows and movies from the iTunes store. I have Netflix to stream in whatever else I don’t already have. Both devices are tiny digital content players that are designed to be plugged-in to your HD TV via an HDMI cable. Both fit in the palm of your hand, connect to your WiFi network, and have separate audio-out ports. Both come with remotes and can be controlled by iOS apps. Both can stream Netflix and have various other ways to get content to the box. Both seem to be liked generally by their users so I don’t see much of a difference in terms of quality or ease-of-use. There are some differences in how the devices deliver their content. Apple provides something of a on-fits-all solution. An HDMI cable delivers 720p video and digital audio and you have the option of using the optical audio jack instead if your TV or receiver supports it. The Roku gives you more options in either direction. The LT only puts out 480p video. You have to bump up to the HD model to get 720p and the XD and XS models get you full 1080p. Each model has an analog AV port in the form of a 1/8″ jack in case you don’t have digital input options at home. This is a technical dealbreaker. If you don’t have HDMI input or you require analog audio, go for the Roku. Both AppleTV and Roku support 802.11n WiFi. The AppleTV has an ethernet port as does the $99 Roku 2 XS. I’ve seen mixed recommendations on using ethernet vs WiFi in terms of speed and quality. This is where the Roku starts to appeal to me. In addition to Netflix, any Roku can stream Hulu Plus, Amazon Instant, HBO GO, and Pandora. Those are the ones that matter to me, but Roku also claims over 350 available channels though if you are interested in taking advantage of that library, you might want to shell out for the XD or XS so you can expand your storage capacity with a MicroSD card slot. The AppleTV gives you access to YouTube (great at parties), Vimeo, a few sports and news channels, and tons of Internet radio stations. Oh, and the entire iTunes Store which includes purchases, rentals, and podcasts. It also includes iTunes Match if you subscribe to that service. TL;DR This is the first dealbreaker on content. If you’re into Amazon, Hulu Plus, or HBO, you’re going to want to stick to the Roku. If you loves you some iTunes Store, go with the AppleTV. If you want to play games on your set-top box, you have to go with the Roku XS which includes a motion sensitive remote for you to use as a controller. Neither the AppleTV nor any of the cheaper Roku models will let you install games. Here’s where the AppleTV scores back major points in my opinion. If you want to play your own content on the Roku, you need to buy the XS which includes a USB port. You can connect a USB drive and play H.264 video, MP3 or AAC audio, and JPG or PNG images. This is a fun feature when your friend comes over with your favorite TV show on a flash drive, but having used a WD TV for a bit, I can attest that manually converting and copying files each time you want to watch something is more hassle than you might want to go through when you’re in the mood to veg out. Unless you’re immersed in the Apple universe, you might have gotten the impression that the AppleTV gets the short end of the stick content-wise, but not so fast. See, Apple has this cool little technology called AirPlay which lets iTunes and any enabled iOS app on the same network push content to your AppleTV. That means movies, TV shows, pictures, and games. Yes, games. Yes, you can play Angry Birds in HD using your iPad as a controller. Yes, you can get around the AppleTV’s lack of Pandora and Rdio apps by pushing the audio from your iPod Touch. Now there’s a few caveats. In order to push video over AirPlay, your app of choice has to have it enabled. That is, unless you have an iPad 2 or iPhone 4S. Apple’s Music and Video apps have AirPlay functionality as well as YouTube and any video content that uses Apple’s built-in Quicktime player (like most videos embedded in websites). Just about anything can stream audio because you can enable AirPlay at the system level through the multitasking bar in iOS. Similarly, if you have a 4S or iPad 2, your device supports video mirroring which means that you can get around the lack of AirPlay functionality in an app. Netflix, Hulu, HBO, and lots of games fall into this category. AirPlay turns out to be the killer features on AppleTV as long as you have a compatible iOS device. Both devices are great and get the job done, so it comes down to your specific needs. My advice? Get the AppleTV. Especially if you already use iTunes and the iTunes Store and have an iOS device or two lying about. You should get the Roku if you want to use Amazon Instant or one of the many Roku channels that don’t have a podcast or iOS app equivalent or if you don’t have or don’t want to use an iOS device that can stream your favorite content to the AppleTV with AirPlay. If you don’t have a TV with HDMI input or your require analog audio, go for the Roku. And I was buying a Roku, I’d get the XS. That USB port is going to come in handy and it’s not a bad idea to have the option to use ethernet and 1080p. If you’re on a budget though, the LT is perfectly fine. It’ll do 720p and if you’re not getting that USB port, just save the money and go all the way down to the LT unless you love 1080p. There’s another option if you’re still feeling a little torn: grab the AppleTV, the Roku LT, and an HDMI switch if you don’t already have multiple HDMI inputs. Save yourself the worry and self-doubt and just drop an extra $50 so you can have all the features you want right there. You’re already used to switching inputs between cable, DVD, and VHS right? It’s not going to be too much of a hassle to have two set-top boxes. …in which case buy a Roku XS or AppleTV + Roku LT.
Apple has found that in rare cases, the batteries in some 1st gen iPod nanos can pose a fire hazard. I found my old nano while I was cleaning the other day, so I went ahead and registered for a replacement. A few days ago, Mac Rumors started getting reports in their forums that, after some extended return times, Apple had started shipping current model nanos as replacements. They confirmed the next day that participants in the program were indeed receiving 6th gen nanos which include increased capacity, a touch screen interface, Nike+, a watch app, and a clip. AirPlay mirroring gets around that pesky lack of AirPlay support in video apps and games. Maybe this was obvious to everyone else, but if you have an iPhone 4S or iPad 2, then you can effectively stream apps like Netflix, Hulu, and HBO to your AppleTV even though they don’t support AirPlay. Did I just buy The Monster at the End of This Book for my iPad? Yes I did. The Verge – "You know, honestly, just buy an iPhone." it’s a very selfish piece of advice: you see . . . it’s simply my path of least resistance to ensuring my advice seeker an acceptable smartphone experience with minimal ongoing technical support from me. He says that the Galaxy Nexus is the best smart phone he’s ever used, but with all the possible variables and technical problems and personal tastes that could cause problems in recommending a phone, the iPhone is a good default bet. And I would agree. Everything you need is in a nice package. You need Windows or a Mac and you need iTunes. That’s it. The interface is intuitive, most social networks have a native iPhone app (available in an easy-to-access App Store), most websites work great in Mobile Safari, the most popular games and apps are available for iPhone, and you get Apple’s tech support and sometimes-lenient replacement policy. Now I think that the iPhone has a lot more to recommend it than just being the lowest common denominator in terms of ease-of-use, but it definitely does have that going for it. Sure, Android might be better for you if you have specific needs or if your tastes push you that way, but if you don’t know what the command line is and you have to ask your tech-savvy nephew to set up your email client for you, then maybe you should go with the iPhone. The best change I’ve noticed though is how the app handles the requests, messages, and notifications menus at the top of the screen. Tapping one of those icons used to slide in a new page from the right (same as if you tapped a link on the page you were viewing). Treating those menus as regular pages had this annoying consequence of creating nested page loops that you would have to travel back through if you wanted to use the back button. So you might end up going through friend’s prifile -> post -> notification menu -> post -> notification menue -> post -> etc… Now, those menus are drop-down popovers that disappear when you tap an item and don’t show up in your history. 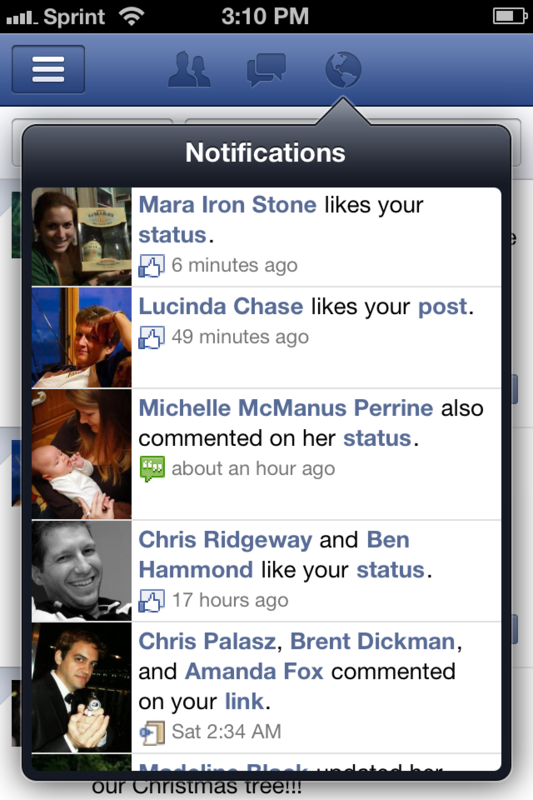 So now if you open your notifications, tap one, and hit back, you’ll be at the page you were on before opening the menu.